In 2015, women represented around 47% of the total labor force. Not bad. 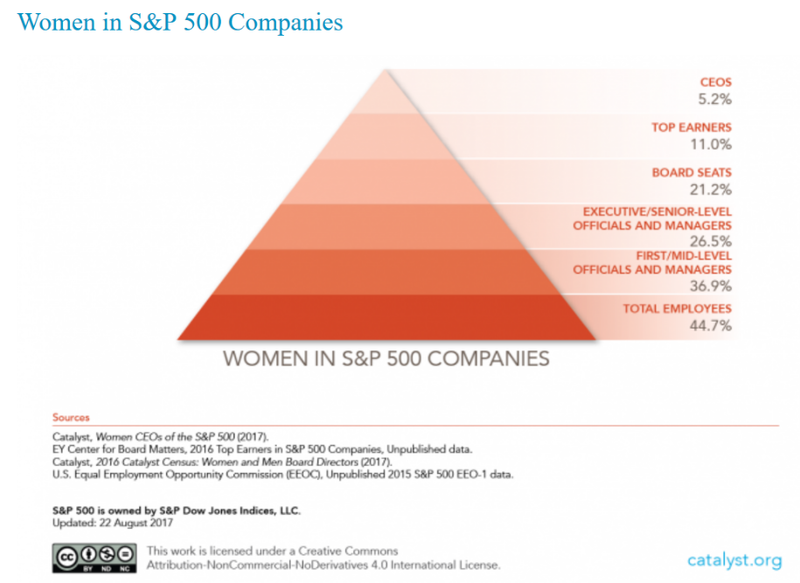 However, a review of S&P 500 companies shows that women hold 5.2% of CEO positions, are 11% of the top earners in the company, and hold about 21% of board seats (Catalyst, 2016). Other studies, such as Devillard, Sancier-Sultan and Werner (2014), have cited a similar pattern of underrepresentation of women at the top of organizations. There is much to discuss on the topic, which is why this is just the first of a series of blogs on women in leadership. But first, let’s talk about why it is important to have more women in leadership roles. Business sense and academic research work together to identify why women leaders are a positive for your organization. First and foremost, greater representation of women in leadership roles is a matter of fairness, philosophically and legally speaking. All positions should be equally accessible to all individuals regardless of non-job related individual characteristics (e.g., gender, race, religion). By having more women in leadership roles, all employees, specifically young women, will see these positions as potential future career paths. Leaders set strategies and make decisions that affect all employees within an organization. When women are not part of the executive team it limits the diversity of perspectives that are presented and considered during decision making. In simple terms, leaders have power, status, and privilege within the organization. They use these leadership perks to set policies and strategic objectives. When women are not in the room, they don’t have a voice in helping to carve out the path of the organization. Additionally, research has shown that gender-balanced leadership teams are less susceptible to issues like “groupthink” where poor decisions are made because all individuals involved have similar viewpoints, backgrounds, and experiences (Opstrup & Villadsen, 2015). Leadership positions tend to pay more than non-leadership positions. Executive leader positions tend to pay even more than managerial level leader positions. Higher pay leads to greater opportunities for the individuals as well as their families. When women stay in lower level roles, they get paid less over the course of their careers which limits their opportunities professionally and financially. This career pay differential is separate from the gender pay gap that exists where women are paid approximately 80% of what men are paid for the same work (Hegewisch & Williams-Baron, 2016). By promoting more women into leadership, the change in wealth distribution can trickle into society as a whole. In recent years, organizations have focused on corporate social responsibility in addition to profitability. They are investing in efforts to be good corporate citizens by contributing to the community and making a positive global impact. A study conducted by the Harvard Business School found that companies with more board directors and corporate officers who are women contributed significantly more charitable funds on average than companies with fewer or no women in senior leader roles. Additionally, the results of this study suggest that companies with more female leaders are not only more committed to social responsibility, but they also develop higher quality social initiatives than organizations with fewer women leaders (Boulouta, 2013; Soares, Marquis & Lee, 2011). Women are more likely to create a female-friendly environment by hiring other women and increasing gender diversity in the organization. Having more women in the organization increases the chances that women will have more opportunities to grow and develop. Having women in leadership roles can foster more diversity by providing positive female role models and potential mentors for younger women who are establishing their careers. Female leaders also tend to lessen the pay gap between men and women (Tate & Yang, 2015). These trends give women more options and greater pay equity. Female leaders tend to have a more communal outlook and leadership style (Matsa & Miller, 2013). As previously noted, in general, they support diversity and socially responsibility. Research has also shown they tend to implement more favorable HR policies. Matsa and Miller (2012) examined organizational behaviors during the recession and found that women-owned businesses were significantly less likely to lay off workers than similar male-owned businesses. Additionally, when more women sit on boards, organizations are more likely to adopt LGBT-friendly HR policies (Cook & Glass, 2016). When taken together with other research around corporate responsibility and pay, the trend suggests that women leaders emphasize diversity, fairness, and communal values in the workplace. Related: How Progressive, Diverse, and Inclusive is Your Company Culture? In recent years, some researchers have focused on the bottom line performance of organizations in relation to gender diversity. Noland and his colleagues (2016) used a sample of over 21,000 public companies across 91 countries to investigate the linkage between gender diversity and company profitability. Their results showed a positive correlation between the two and predicted that organizations with 30% or more female leaders could increase their net margin by up to six points. 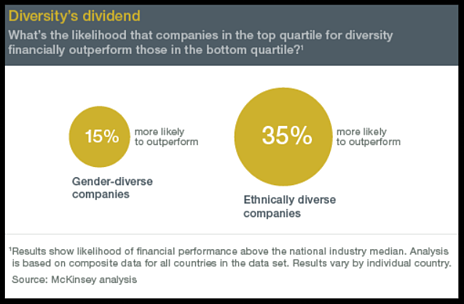 Similarly, a study conducted by McKinsey in 2015 (Hunt, Layton, & Prince, 2015) looked specifically at the relationship between diversity (both gender and ethnic) and company financial performance. They also found a significant positive correlation. Companies with low diversity consistently performed worse financially than their more diverse counterparts. Whether to help the bottom line, provide fair and equal opportunity, or maintain a balanced and effective strategy, companies will benefit from a diverse leadership team. Stay tuned for future blogs where I'll dig into some of the theories and explanations for the gender gap in executive leadership. Boulouta, I. (2013). Hidden connections: The link between board gender diversity and corporate social performance. Journal of Business Ethics, 113(2), 185–97. Catalyst. (2016). Women in the workforce: United States. [Fact Sheet]. Cook, A., & Glass, C. (2016). Do women advance equity? The effect of gender leadership composition on LGBT-friendly policies in American firms. Human Relations 69(7), 1431‒1456. Devillard, S., Sancier-Sultan, S. & Werner, C. (2014, April). 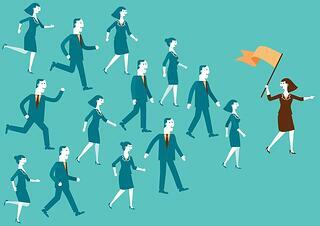 Why gender diversity at the top remains a challenge. McKinsey Quarterly. Hegewisch, A. & Williams-Baron, E. (September 2017). The gender wage gap: 2016 earnings differences by gender, race, and ethnicity. [Fact Sheet]. Hunt, V., Layton, D., & Prince, S. (February 2, 2015). Diversity matters. [White Paper]. Matsa, D. A., & Miller, A. R. (2013). A female style in corporate leadership? Evidence from quotas. American Economic Journal: Applied Economics, 5(3), 136–69. Matsa, D. A., & Miller, A. R. (2014). Workforce reductions at women-owned businesses in the United States. Industrial & Labor Relations Review, 67(2), 422–52. Noland, M., Moran, T. & Kotschwar, B. (2016, February). Is gender diversity profitable? Evidence from a global survey. [White Paper]. Opstrup, N., & Villadsen, A. R. (2014). The right mix? Gender diversity in top management teams and financial performance. Public Administration Review, 75(2), 291–301. Soares, R, Marquis, C., & Lee, M. (2011). Gender and corporate social responsibility: It’s a matter of sustainability. Catalyst White Paper. Tate, G. & Yang, L. (2014). 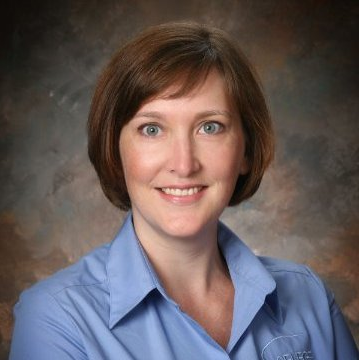 Female leadership and gender equity: Evidence from plant closure. Journal of Financial Economics, 1-21.